Corrie was heavily influenced by her father who was a woodworker and her mother who was a painter. Throughout life’s setbacks and tragedies, she found art to be her refuge and a potent therapy. 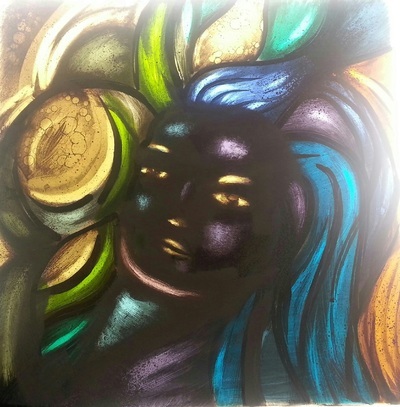 In 2008, she started building custom stained glass for private residences and businesses, completing may projects from entryways, to bar backs, to window installations. In the last year, she has worked in many mixed media for various clients. 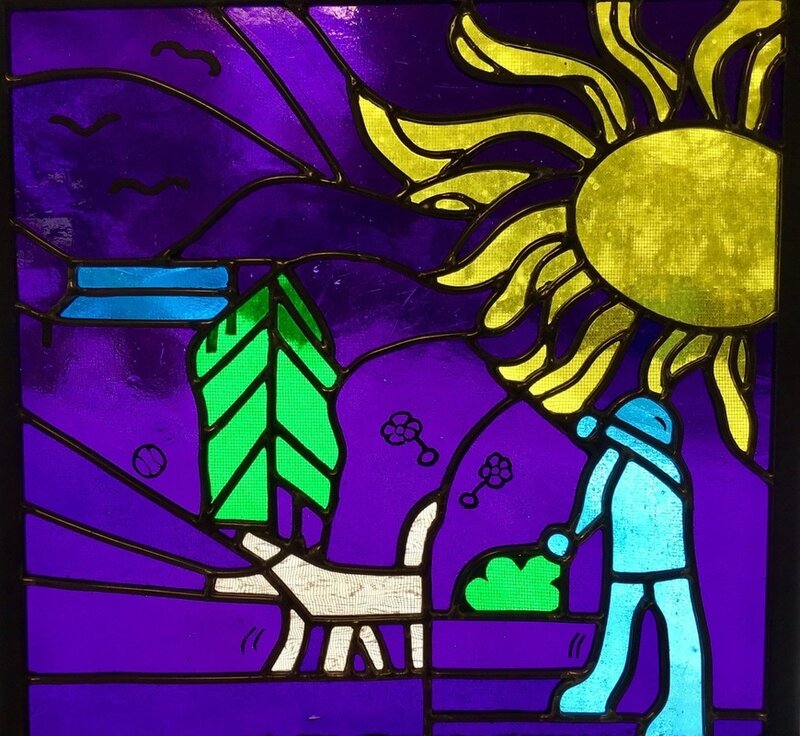 Corrie has been fortunate to study under well accomplished stained glass artists in fields of study from traditional stained glass painting to modern glass fusing techniques. 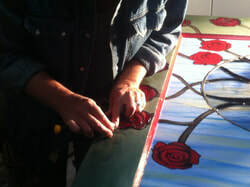 She has found her place in this industry by using a variety of techniques and materials to achieve the vision of the finished work. She has learned much of the history of stained glass itself from her many restoration and repair projects on vintage stained glass pieces. She has been the director and concept designer and painter of the Historical Mural in Virginia City, Nevada. During this project, she studied old European style painting. 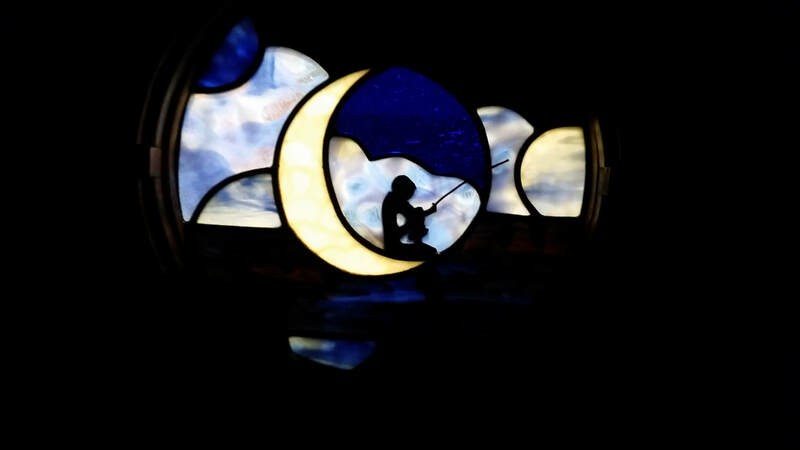 An early start in the arts and an unbroken career of development have brought her to her current state as a business owner in Virginia City providing custom stained glass piece to many different clients and businesses. Let's build a custom piece! "Little Miss Sunshine" Hannah passed away suddenly at the age of 12. This is her art work from elementary school. Every morning when I wake up and see our Sunshine it brings a smile to my face, joy in my heart and a love in my soul. You captured and embraced the essence of Hannah-her spirit and life. Thank you for celebrating her life with me. 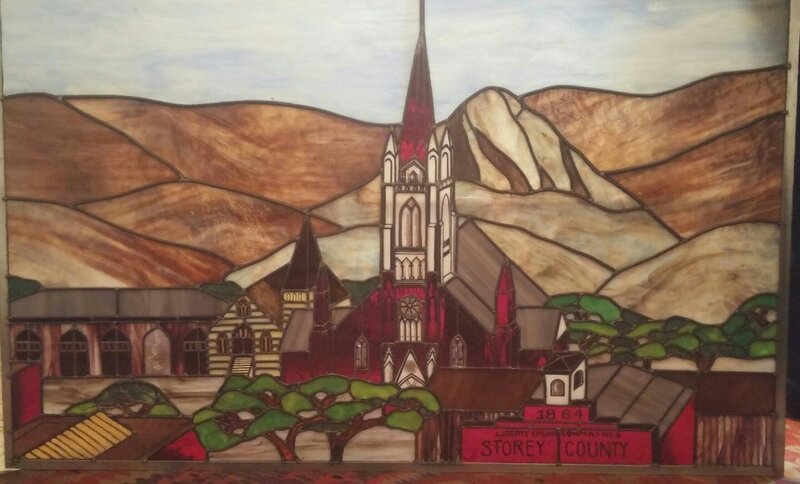 ​ ​I commissioned Corrie to do a large stained glass window depicting Virginia City & St. Mary’s Church where my husband & I were married. What I received was, in a word, “magnificent”. She designed and created the most amazing piece of glass art I have never seen: copper accents, old square nails used as crosses for the steeples, stained glass within stained glass, hand painted details, etc. etc. As my neighbor who has worked in stained glass exclaimed when she saw it, “You have a masterpiece by the current day Tiffany". Indeed, I believe L.C. Tiffany would be challenged to complete something as detailed and exquisite as this piece of art! It’s all true. ​Fire Horse has the knowledge and ability to create a myriad of beautiful images. Corrie has assembled a team of talented artisans to draw upon for restoration projects ongoing at our Episcopal Church in Virginia City. Her distinct talents are found everywhere she is called upon for art and preservation. Her work on the cemetery transom window and door panels is a great addition to the cemetery visitors center. It makes us stand out. It looks really cool. ​She understands what the Comstock is and wasn't freaked out about old stuff. The window is really wicked. All images and art are the property of the artist Corrie Zam-Northan and are protected by US copyright laws and cannot be reproduced, copied, downloaded, linked or transmitted by any means without prior written permission from the artist.